Imagine you're a sea captain or a truck driver, a pilot, or a mother driving your child to preschool. You're focused on the people or goods you're moving and the easiest and quickest way to get where you want to go. As your cell phone rings or your BlackBerry buzzes, you concentrate on what the caller is saying. You don't spend time pondering how your trip, or your phone conversation, is part of a much larger network of shipping, air, road, rail, and digital lines that wrap the earth. You may only be vaguely aware of how the network has evolved through many stages, relying on sail power; then steam; oil; and, more recently, the energy of computers, rockets, and other advanced technologies. You probably won't consider that during the last 50 years, this network that moves goods, people, and information around the globe has grown with lightning speed. You may not realize that this network continues to expand at an ever-accelerating rate. But paying attention to the global network, and to the continental network where you live within it, is quite possibly the most important thing you could do. The human network has created unprecedented wealth and has allowed society to connect and evolve in new ways. Yet its growth is uncontrolled and chaotic. This has not only created social and economic dislocation, but it has also placed relentless pressure on the world's ecosystems. The network cuts through the last natural areas on earth, continuing to fragment farms, forests, and wilderness into ever-smaller shards. This network of trade, transportation, and information is so much a part of your life that you, like everyone else, remain blind to it. We need to create a new science, a new political and business structure that will help us understand the fundamental needs of human and natural systems and allow them to coexist. As environmental advocates, we must understand and reach out to those who build the network. We must help them understand, in detail, how this network destroys natural systems. Then, we can begin to devise a new framework that will rebuild what we have destroyed. As many recognize, reconciling people and nature is now one of society's central challenges. If we hope to meet this challenge successfully, we must not assume that we already know all about the problem. If we hope to manage our infrastructure in harmony with natural systems, we must cultivate a whole new point of view. Both the environmental community and society at large have become increasingly specialized. As a society, we focus too much on bits of the problem: this endangered species, that development proposal, that carbon credit initiative, this road project, or that flood levee. We spend far too little time looking at how they all fit together. Of course, anyone who makes a daily to-do list knows that problems need to be broken down into manageable pieces. The trick, however, is to not lose sight of the big picture while working out the details. We must stop being afraid of generalists. How do we start to build this new framework? First, we need to look closely at the network that humanity has built to meet its needs. Before we can talk in detail about solutions, we need to fundamentally alter the way we see our situation. We need to rise above all the details, to see our problems in the big picture. We need to stop trying to fix the environment and figure out how to manage the network. To do that, we need to understand the network: How has it evolved? What does it look like now? Today, the network that has formed across North America is denser, faster, and more complex than is usually imagined by politicians, business leaders, or environmentalists. As the 20th century began, the country had few paved roads or automobiles. By 1960, 1.2 million miles of paved roads had been built to serve 61.6 million cars. By 2004, those same numbers more than doubled: to more than 2.5 million miles of paved roads and more than 136 million vehicles. The recent increases in the network's complexity and speed have been so fast, and the changes so profound, that it's difficult to remember how things used to be not so very long ago. In the late 1940s, a superhighway meant a four-lane road with unlimited access: no on-ramps, no off-ramps, no overpasses. Propellers powered planes, which had to stop for gas on their way across the continent. Bulk cargo made its way across the oceans on freighters; container ships did not exist. In the mid-20th century, egrets in the millions used to nest in the Florida Everglades. Now birders exclaim when seeing just a few dozen egrets at one time. In the Pacific Northwest, salmon used to run in such numbers that anglers joked it was possible to walk across rivers on the backs of the salmon. Today, 40 percent of those streams have no fish at all. Air laden with mercury and other pollutants remained the exception rather than the norm. In those daysthough things weren't perfectthere were still places humanity didn't reach. For centuries, a spider web of two-lane roads and regional transit systems linked the few large Northeast cities to a scattering of towns set in a rural countryside. During World War II, the network began to expand and strengthen as the first four-lane divided roadsthen called "superhighways"began to facilitate traffic flows and connect the major urban centers. As the map shows, the Northeast remained primarily rural: Cities were still dense. The automobile had not yet allowed them to decentralize and sprawl. To fully understand the development of the United States' Northeast, we need to understand that the human network is not new. It has been evolving since people first set foot on the continent. It began slowly. In America, native footpaths through the wilderness formed the first tendrils of the network. Then, nearly 400 years ago, European settlers landed. As colonial settlements gradually took form, the French, the Spanish, and the English widened the tracks into dirt roads and established shipping routes and ports on the coasts and along the rivers. For more than two centuries, dirt roads and rivers formed the North American network. The few "turnpikes" were nothing more than log roads to help foot travelers and lumbering Conestoga wagons avoid the mud. Waterways remained the most convenient highways through the new nation. With the development of the steam engine in the late 18th century, the network's development began to accelerate. Less than 50 years later, steamships were crossing the oceans and plying the rivers. Railroads crossed the landscape, linked the cities, and pushed inland, deep into the Midwestern plains. With great fanfare, Union Pacific and Central Pacific track crews in 1869 drove the last spike into the transcontinental railroad at Promontory, Utah, thus linking the east and west coasts. The nation's entire rail system only comprised 52,922 miles then. Within 30 years, more than 163,000 miles of track crisscrossed the country. Telegraph lines followed the railroad lines, initiating the first communications revolution. These corridors of transportation and communications rapidly spread and transformed the continent, as booming cities reached farther and farther into the wilderness for raw materials. Steam engines and telegraphs began an ever-accelerating process of massive environmental impact that continues today. Railroads fragmented the landscape. As railroads conquered distance, depletion of natural resources accelerated. Timber was extracted from what was believed to be endless virgin forests. Pollution increased as the network grew. Factories demanded more energy to fuel the same steam engines that had changed the methods and finances of manufacturing. As population and incomes grew, the demand for food and new homes eroded the landscape, changing fields and forests into farms and farms into suburbs. All these developments hastened extinction. Ladies' fashion doomed the carrier pigeon and the flamingo. Railroads brought sportsmen to the prairie, where they slaughtered millions of buffalo and left them to rot. Later, as the network developed, tons of domestic beef traveled by rail to markets in Chicago, Illinois. Again and again, throughout the 20th century, this cycle of environmental destruction has repeated itself as the network has added new "layers" and developed new capacities: Railroads led to roads, which then led to airplanes. Telegraphs led to telephones and computers and satellite communication. Each development increased the efficiency and the reach of the human network. As it has developed, the network has added more layers, each of which has become more specialized. As autos and air took over passenger traffic, railroads and steamships increasingly hauled only freight. This increased specialization has more tightly linked the network and made it more interactive. It exerts an ever-greater influence on our lives, businesses, governments, and institutions, which have also dissolved into a mosaic of disciplines and subdisciplines. We need to get beyond our own communities, our interest groups, our specialties. If we try to see our nation as an integrated whole, it becomes obvious that cities and metropolitan areas are the smaller and larger networks that have grown at the interstices of a great continental network. At key access points that link the United States to the larger global networkAtlanta, Georgia; Chicago, Illinois; Los Angeles, California; New York, New York; or San Francisco, Californialarge urban areas have grown up like spider webs between the branches of an enormous economic tree. The Interstate Highway Act of 1956 created a macro-scale pattern of highways, forming a new framework that increased accessibility and mobility. 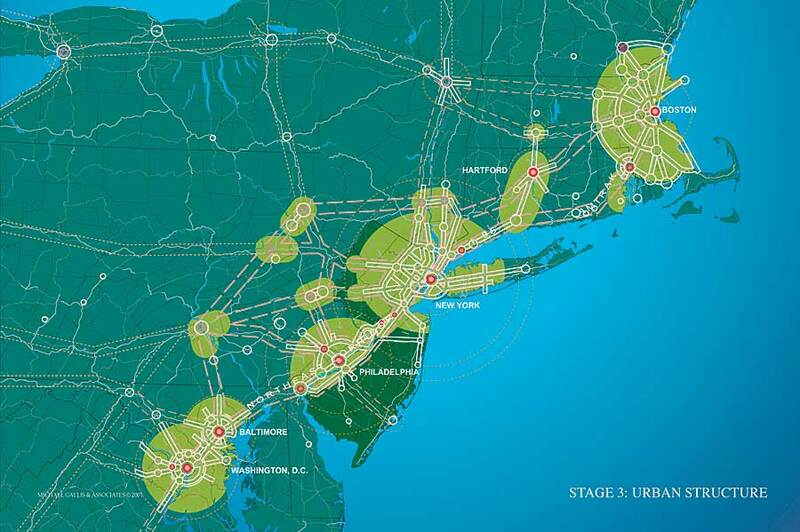 The first phase of this new network developed in a linear pattern along the Northeast Corridor, a combination of I-95, New Jersey Transit, and the Amtrak line that connected the region's cities. The second phase of the network began in 1975 as the first urban beltways provided a new framework for even greater suburban expansion and connectivity. So let's take an example so familiar that we think we know all about it: the Northeast corridor of the United States, the area from Washington, D.C., to Boston, Massachusetts, the nation's oldest urbanized region. In 1960, this region had already been labeled a megalopolis, a seemingly borderless urban region that reached beyond traditional city boundaries. Since then, the eastern seaboard has urbanized much more quickly and in a much different pattern than predicted or broadly understood. The East Coast is not the linear corridor and continuous urban smear that was predicted and that most of us imagine. Rather, the region has morphed into an urban lattice composed of metropolitan centers and corridors extending westward. When World War II ended in 1945, the cities from Washington, D.C., to Boston remained almost as highly dense and clustered as when they first had been settled four centuries earlier. A series of parkways and turnpikes had begun connecting the seaboard's cities, but these were single-purpose segments. The Pennsylvania Turnpike, for instance, had been built to link Philadelphia to the Midwest, not to intersect with the New Jersey Turnpike and throughways to form a network. Consequently, these roads had not formed a large-scale grid. New Jersey, in the center of the 11 states that make up the region, remained an agricultural area. Its nickname, the Garden State, had not yet become an irony. The Interstate Highway Act would change all that. Passed in 1956, the act created a new foundation for growth: an interstate grid that connected the six large metropolitan areas of the Northeast. Planners sought to create a passage, now known as the Northeast Corridor, that would link these urban centers, reducing intercity travel times and increasing economic synergies. Their strategy worked. However, the interstates' initial phase also created a platform for suburbs to spread across the land gobbling up wildlife habitat and resources, extending the fragmentation, depletion, pollution, erosion, and extinction of natural systems. Work began on the New Jersey Turnpike in 1950 and later merged with the construction of I-95 to complete the Northeast Corridor by 1960. Between 1950 and 2000, New Jersey's population doubled, and by the dawn of the 21st century, only two million of the state's six million acres remained undeveloped. The new roads made it possible for ever-greater numbers of people and goods to move around the state. Population density increased. Suburbs more than doubled the urban area surrounding the cities of Philadelphia, New York, and Boston. As growth continued, New Jersey housing became highly desirable. Not only could the state offer an exceptional landscape of mountains and shores, it lay between Philadelphia and New York, the region's two largest cities. The new highways transformed the Garden State into an urban state. The state's myriad small towns no longer dotted a rural countryside. Instead, in the north and south, they had grown together. High-capacity interstates created a new kind of transportation corridor that provided greater accessibility and visibility for businesses. This, in turn, changed the pattern of economic activity. The new corridors attracted commercial development and evolved into long strips of restaurants, hotels, office buildings, industrial parks, movie theaters, and shopping centers. New urban centersunrelated to the usual geographic features like ports or riversformed at key points and intersections of the interstate network, like Tysons Corner, Virginia, outside Washington, D.C., or the Meadowlands in New Jersey. Two years after the first interstates opened, the first commercial jets entirely changed the pattern of long-distance travel. Airports provided the most efficient access to regional, national, and international markets. This ended the grand era of train travel as people flocked to the airports for quick connections to distant locales. This proved a great advantage to the larger cities with well-developed airports and a terrible disadvantage to the small cities with limited air service like Hartford, Connecticut; Harrisburg, Pennsylvania; Wilmington, Delaware; and Danbury, Connecticut. Those who envisioned the interstates saw them as a strategic tool to connect cities, moving not only goods but also tanks and other weapons in case of war. Yet the roads themselves became linear cities as more homes and businesses clustered around these high-speed corridors. They also became the habitat of bumper-to-bumper traffic. To relieve this pressure, metro areas began to construct beltways around urban areas. But these new ring roads did far more than ease traffic congestion. They greatly expanded the urban edge, opening up thousands of square miles of "green space" to development. No one meant to cause urban sprawl and environmental degradation. It just happened. In Boston, for instance, the first ring, Route 128, was built 5 miles out from the city. Then a second ring, I-495, went in about 30 miles out. A third ring, a combination of I-195 and I-90, now lies approximately 45 miles from downtown. While the population of Boston's city center had declined from 800,000 to 500,000 since 1970, the population of the Boston metro area has grown by 5 times to 4 million. During this period, the amount of space these people take up has increased to 10 times the area of the original city. As this pattern repeated throughout the Northeast, the natural landscape was disappearing faster than at any time in history. Strangely, as the human network became more complex, the engineers and policy makers who planned it became more specialized. While the designers of the interstate system looked at the continent as a system, those who followed them did not. Increasingly, planners did not emphasize network performance, how each segment or component fit into the larger system. Instead, they focused on each segment, such as the links between New York City and Albany, the state capital. They defined performance narrowly: by capacity alone. They gave little attention to the patterns of urban growth, the economy, or our quality of life. As a result, transportation planning became reactive, responding to congestion and safety issues. We no longer set any proactive goals: When we plan a road, we do not try to achieve a better network, a stronger economy, or a healthier environment. The same is true of other growth and development issues, such as zoning and water management. After 1990, global integration, the formation of the North American trading bloc, the breakup of Conrail, and e-commerce resulted in a new configuration in the pattern of the network. The previous linear pattern of development began to transform into a parallel north-south set of growth points connected by a set of east-west interstates. This lattice is evolving into a pattern with multiple nodes and connections, each with an increasingly specialized role in the urban, economic, and transportation structure of the Northeast. This new lattice is generating a much broader pattern of urbanization across an even larger landscape. We have become more narrowly focused while our reach has become almost impossibly wide. Since 1990, this network has morphed into a massive urban lattice linked by a series of centers and corridors like a gigantic Tinkertoy. The breakup of Conrail and the introduction of e-commerce redefined the pattern of distribution, transportation, and logistics across the Northeast. Conrail's subdivision introduced two rail systemsCSX and Norfolk Southerninto the region, each of which sought to develop its own system of hubs. The introduction of e-commerce created a single integrated marketplace. Yet a new pattern emerged: The older urban centers of Scranton, Allentown, Bethlehem, and Harrisburg, Pennsylvania and Wilkesboro, North Carolina, began to play important roles as inland hubs. The Norfolk Southern Railroad concentrated on these cities as new distribution points. At the same time, the Internet and global positioning systems made "just-in-time" delivery and e-commerce the norm. Retailers no longer shipped goods to one place and hoped that they would sell. If an item was moving sluggishly at one outlet, it could be "redeployed" to where shoppers demanded it. Or, through e-commerce, the item could be shipped directly to consumers. This fueled a boom in the freight industry. Suddenly, erstwhile Rust Belt towns enjoyed a competitive advantage as they could receive goods from inland locations, West Coast ports, the Southeast, and Mexico and distribute them up and down the eastern seaboard. Bypassed for a century, these towns now enjoyed a renaissance as they grew into trucking and rail hubs with "fulfillment centers" that transferred goods from mode to mode (e.g., air to rail to road). Places like Harrisburg, Pennsylvania, could now serve Baltimore, Maryland; Philadelphia, Pennsylvania; and Washington, D.C. In Upstate New York where I-84 crosses the Hudson River, Newburgh could now serve New York, New York; Hartford, Connecticut; Boston, Massachusetts; and Providence, Rhode Island. While these smaller metro areas began as distribution hubs, they quickly added "back office" data processing operations, housing, retail, and industry. Each created its own network of roads, water mains, and power systems. 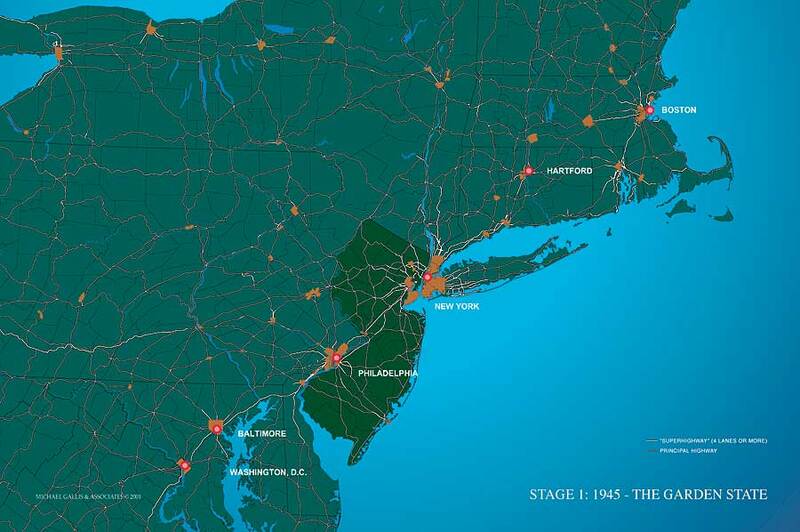 East Coast development no longer centers on the Northeast Corridor but extends westward to places like Scranton, Pennsylvania, and north to places like Newburgh, New York. The system of interstates that now extends west from Washington, D.C.; Baltimore; Philadelphia; New York; and Bostontogether with the interstates that extend north and south between I-81 and I-95now forms a gigantic lattice. That provides a new framework for growth that is now not just concentrated along I-95 but extends inland to the Lehigh Valley, north up the Hudson River, and south into northern Virginia. The individual metropolitan markets of the mid-20th century have transformed into a huge consolidated urban market serving the 52 million people who now live in the Northeast. In the space of just a few decades, the landscape of the Northeastern Corridor has changed dramatically. What was once a region with dense cities separated by farms and natural areas has become a nearly continuous urban region that is extending inland to smaller hub cities. This new urban superstructure took form in response to the forces that were generated as the continental grid integrated with the global network. This, in turn, has sent the global economy into overdrive, growing at the fastest rate in human history according to World Bank figures. This ever-growing lattice of development also presents new and massive threats to the environment. More and more roads slice across ecosystems and migration routes. More and more people demand more resources and create more pollutants. More and more species are finding that they just can't survive within this human network. While the story of the Northeast provides the most advanced example of this problem, it is not the only example: It has analogues across the continent. Chicago's metro area now extends across five states. Denver, Colorado Springs, and Pueblo, Colorado, are growing together and even reaching out north to Cheyenne, Wyoming. Other metro areas like Los Angeles, California; Houston, Texas; Miami, Florida; and Atlanta, Georgia, keep expanding with no end in sight. The same is true of smaller cities like Lexington, Virginia; Charlotte, North Carolina; and Memphis, Tennessee. As these metropolitan spiderwebs continue to grow ever larger, the continental grid grows stronger. More and more goods flow through these thruways. And as a result, the land between them is being further fragmented, depleted, polluted, and eroded, and more species are becoming extinct. Even more damaging, the densest human developments often grow up in the areas of greatest biodiversity, such as coastal regions and river valleys, where cities were originally located to have access to the water. In desert cities like Phoenix or Tucson, Arizona, the growth of the network has led to the desire to re-create the green cities of the Midwest and East. This has altered the natural landscape and upset the fragile ecological balance. The growth of this network remains almost wholly uncoordinated and unplanned and is the biggest problem facing the environment. Our current framework is inadequate to meet this challenge. For instance, a city like Portland, Oregon, may try to curb its growth, defining strict city limits and lot sizes. But Portland can't control the growth that goes on across the Columbia River in Vancouver, Washington, or south in between other Oregon cities. What about smaller urban hubs? How will we integrate their development? As a society, we talk far too little about these questions. Seeing this network is the first step to recognizing that we must better manage it. Take the situation in the Highlands of northwestern New Jersey, where northern forests overlap with the southern Piedmont. Development pressures in the Highlands, once a pristine pocket in an overdeveloped state, have become extreme. How will we resolve this? We can't do it if we continue our old ways of seeing. While the planners laid out the interstate system with an eye toward a continental system, they never applied the same kind of thinking to metropolitan areas. Instead, planners focused on one project at a time, each in isolation from the others. Our bureaucracies and businesses have become increasingly specialized. So have the academic institutions that train our leaders. Like in medicine, a discipline that has subdivided again and again, the generalist has disappeared from our environmental, economic, and planning discussions. As a result, we have lost any understanding of the entire networkjust at the time when this insight is most crucial: today, the human network's reach and complexity have nearly exceeded our ability to understand what we are creating and how it affects us. Most of us don't even see the network that has come to dominate our society, our economy, and our environment. Today, the network has come to dominate our way of life: Transit schedules and digital clocks orchestrate our days, not the ebb and flow of natural systems. We carry cell phones everywhere, living lives of perpetual motion made possible by the network. We all exist within this complex network of human development that has a stranglehold on natural systems. Most now acknowledge the reality of global warming. But while that massive problem certainly demands attention, we must also address the root cause of rising temperatures and every other environmental problem: that root cause is the human network in which we all live. So far, we have reacted to environmental damage in two ways: either by adapting to it or by trying to mitigate it. American Forests now promotes a third solution: strategic environmental development. We are dedicated to beginning this process. If we begin to see the network and how it affects our cities, regions, and continents, we can begin to figure out how best to design and build it. We can begin to weave human and natural systems together. We can begin to build links between business communities and environmental groups. We can develop a new science to guide these efforts, building up the environment as we build the human network. We can begin to be part of a big-picture solution. This is the second in a series of articles focusing on the need for decision makers to understand that nature and humans must work together. Gary Moll is the leader of the Urban Ecosystem Center at American Forests. The center has conducted ecosystem analysis on more than 40 metropolitan areas. In 1996, the center produced CITYgreen software to assist GIS users in analyzing their local ecosystems. Michael Gallis is a member of the board of directors for American Forests, an Esri Business Partner, and a strategist and principal of Michael Gallis and Associates in Charlotte, North Carolina, a strategic planning and design firm. Heather Millar is a Brooklyn, New York-based writer who has written for many magazines, including the Atlantic Monthly, National Wildlife, Sierra, and Smithsonian. For more information, visit www.americanforests.org, then click on "Learn More," which is under the globe. In the Fall 2007 ArcNews, look for "People-Nature: The Natural Network." We will explore how the human network crashes through the nation's environmental regions and current efforts to cope with the resulting damage. See also the previous article "Nature, the Human Network, and the Role of GIS" in the Winter 2006/2007 issue of ArcNews.